Today it all about Diamond Waves from Carolyn! I have to say this page is the most "ME" from this week! Red, black, gold....yes me! I totally loved how it came out. As a matter of fact this is another one where I just was so mad at myself for not starting it on a canvas. 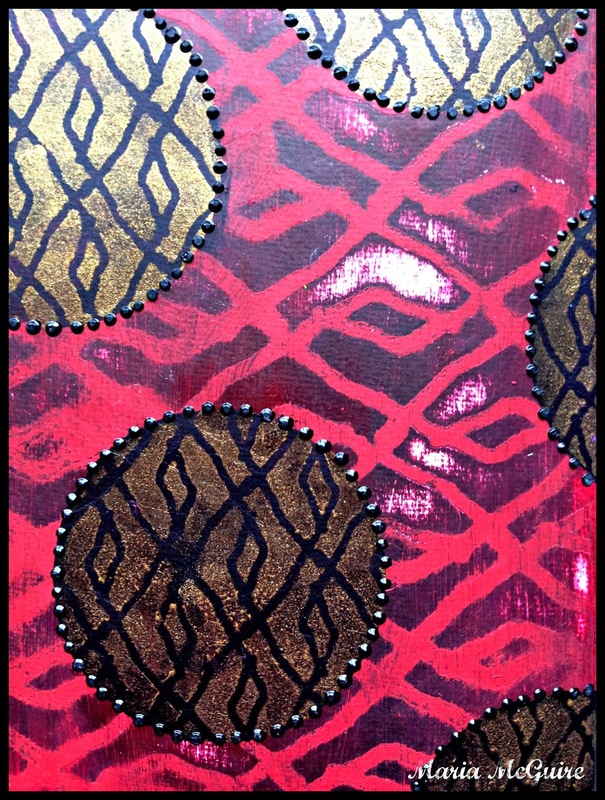 Here is a little "bonus" background I did in my journal with Carolyn's Linked stencil. I hope you liked this week of stencil inspiration! I post the 3 winners back on this post Tuesday, February 11th. This one is so you! Wonderful red and black! This would rock on a canvas! You have such patience to put the black dots around it...can you teach me patience? I, too, love the black dots. 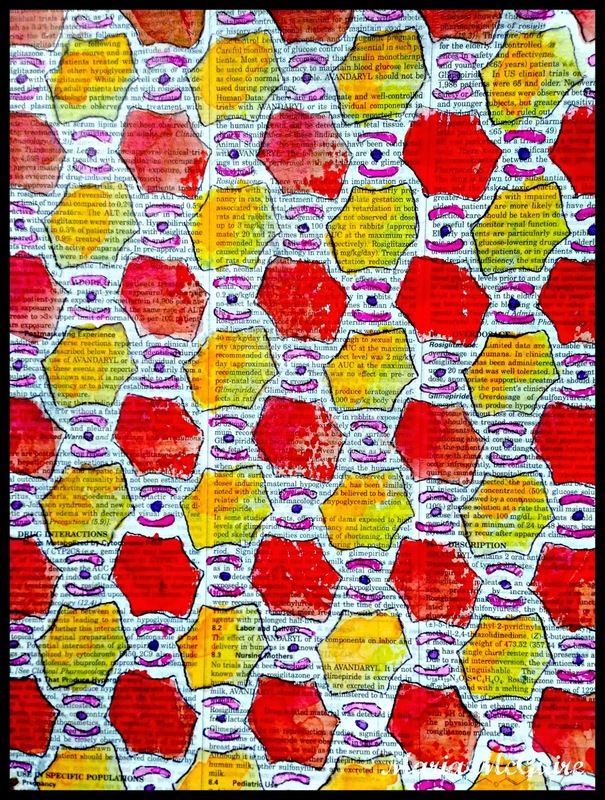 Did you use a 3-D fabric-type paint like Scribbles? Yes, EFKaplan, I used Scribbles on this one :) Thanks for stopping by! Gorgeous. It looks wonderfully rich and somehow Eastern! I really like the way you have used the great stencils all the different effect when you use color and position of the stencil. greag blog, I really like the one with the Circles. Wow. Gorgeous, really loved the way you turned the stencil in the circle and those dots add so much to it! Thanks for the inspiration! Both pieces are wonderful. I really like the rich colors, and texture in the first piece. And the way you stenciled over that text background is so cool! I love how you used the stencil in different orientations! Beautifully done! I love this stencil! Thank you for the chance to win!! I love all the ways you have used the stencils this week! Great colors on today's project! Just love staring at both of these. I peeked in earlier today, but came back now because I have the time to both leave comments on all the work you've so generously shared and to ooh and aah over these beautiful pieces. Wow! So cool! And inspirational! 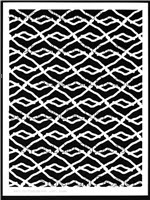 I have a list a mile long of all the stencils I need - want - need…. Are my eyes playing tricks or are the Diamond Waves in 2 different sizes. The black and gold appear to be smaller to me. But then again, your reds look more purple on my screen. Need to do some color correction. Anyway, absolutely love the first one as a finished piece and the second one as a great background for added fun. Thanks again. Just went to Stencil Girl to check out the 6x6 sizes and got my answer. Sorry for not checking it out first. Just love your use of stencils and color and the way you finish off the piece. So much color and shapes and details. Love your use of Diamond Waves - your bonus background is fabulous too! New to stencils,would love a chance to win some.Great work! 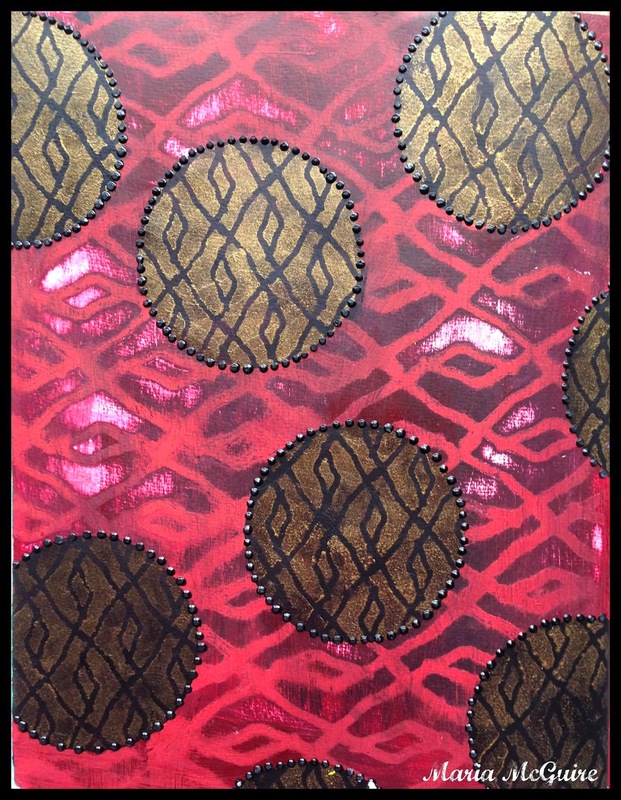 Oh my gosh, I love the color combinations and how you used Carolyn's wave stencil in the different ways and different directions. The final product is stunning. Yes, it would have been lovely on canvas! I also love the page with the linked stencil. Thanks again for showing us how you used all of Carolyn's stencils that you showcased. It's been a fun week! Thanks for the chance to win. I really like that bonus background.